Make yourself at home in one of the 116 air-conditioned rooms featuring refrigerators and flat-screen televisions. Complimentary wireless Internet access keeps you connected, and cable programming is available for your entertainment. Bathrooms have complimentary toiletries and hair dryers. Conveniences include phones, as well as complimentary weekday newspapers and microwaves. Dip into one of the 2 outdoor swimming pools or enjoy other recreational amenities including a lazy river and a fitness center. Mingle with other guests at the complimentary reception, held daily. Wrap up your day with a drink at the bar/lounge, the beach bar, or the poolside bar. A complimentary hot/cold buffet breakfast is served daily. 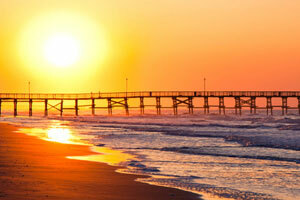 The preferred airport for Best Western Ocean Sands Beach Resort is Myrtle Beach, SC (MYR). A deposit of the cost of one night's stay is payable and is due within 7 days of arrival in summer, and within 3 days of arrival at other times. To complete the reservation process and obtain additional information, please contact the property using the information on the reservation confirmation received after booking.